​Oak trees at the entrance to Sinsheimer Park are a testament to the legacy of tree planting. One Cool Earth and student volunteers from the after school program Students Taking Active Responsibility (STAR) worked together almost two decades ago to plant live oaks at the entrance of of the park near the tennis courts. Since then, the trees have matured and we have returned to collect acorns from trees which we planted as acorns years ago! 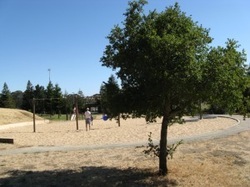 Now they provide great shade near a playground and will continue to do so for years to come.